This pitcher and bowl set was made by the Ford City China Company over a hundred years ago in Ford City, Pennsylvania. The company was started in 1898 by John Wick, Jr. and Captain John B. Ford and only existed as the Ford City China Company between the years of 1898 to 1904. It later became part of the Pennsylvania China Company. This pitcher and bowl came from my father’s family homestead… a house and land that had stayed in the family from 1780 until a few years ago. The house was full of family antiques that were immediately sold at auction by the new owner. I bought this pitcher and bowl. 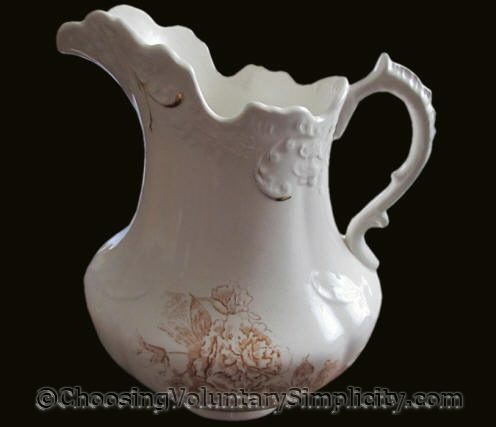 The top of the pitcher has a very scalloped edge as well as a highly embossed design. 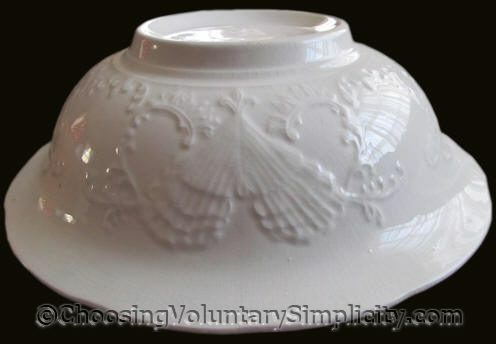 The same embossed design is repeated and expanded on the underside of the bowl. This pattern is called Wyandotte. It’s a distinctive floral pattern with delicate shading, and it appears on the inside of the bowl and the outside bottom half of the pitcher. The gold leaf design appears on the rim of the bowl and also around the rim of the pitcher. How interesting…Ford City is a neighboring town 30 minutes from where I live…what a pretty pitcher/bowl…thanks for sharing. I am so envious. 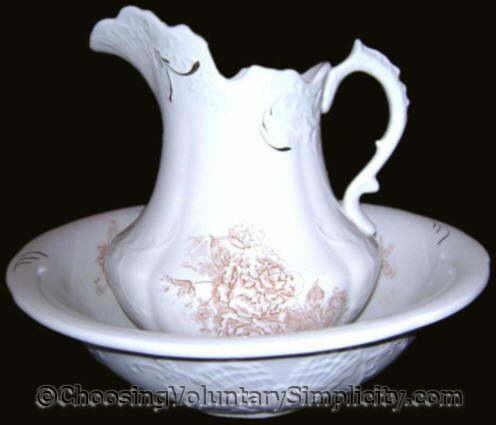 I have always wanted an antique pitcher and bowl for the old washstand my grandma gave me. I think yours is beautiful. I love this set Shirley and I am so thrilled that you have something from the family homestead for you now and to pass on. There is something so concrete about holding or touching a thing(item) from the past. I sometimes get my Mom’s things out and just admire how she cared for them for her 89 years and now they have been entrusted to me. It is a very special feeling touching or using or even cleaning something that someone in our family line before us had done the same too! Thanks for sharing and as always love your blog. I think I have this in blue. Mine is not in such good condition and it has very little of the trademarking left so it’s hard to read but the embossed design and the gold markings are the same. I have been looking for a long time to find something about this and I am so happy to have found your site, it is wonderful. Grace, that is the way I feel about old things, especially the simple everyday things… there must be so much “history” if we only could know. Thanks so much for posting this. I only have the pitcher that my mother passed on to me, she said it had been my grandmothers. The flowers are a purple color and there are a few cracks and some of the gold has worn off.